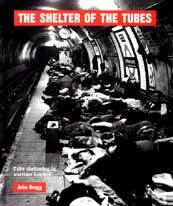 An excellent and well illustrated book which looks at London's underground railway shelters in wartime Britain. An excellent and well illustrated book which looks at London's underground railway shelters from the early initiatives to protect the public from the Zeppelin raids of 1916 through to the dark days of the V1 and V2 Blitz at the end of the world war two. John Gregg looks at the many uses of redundant tube stations during the war, including Churchill's Down Street office and sleeping accommodation in the old tube station. The social and human elements of the shelter communities are covered in detail with some superb photographs which haven't been seen before. As the chapters unfold, we learn about the problems of feeding, amusing and caring for the shelterers throughout the peaks of London's front line war. The book offers enough academic interest with facts and figures presented alongside the stories of the shelterers themselves. John Gregg gives a warm and encouraging picture of the community spirit which must have maintained the initiative to go back night after night, for relative peace and safety in some rather unpleasant conditions.